If you’ve never heard of Tommy Kono, he probably wouldn’t have held it against you. Kono was a Japanese American man of humble origins, born in Sacramento, CA, who spent three years of his childhood in northern California’s Tule Lake internment camp. He also may have been the greatest weightlifter the world has ever seen. Kono rose to fame in the 1950s, winning Olympic gold medals in weightlifting for the U.S. in 1952 and 1956, and a silver in 1960. 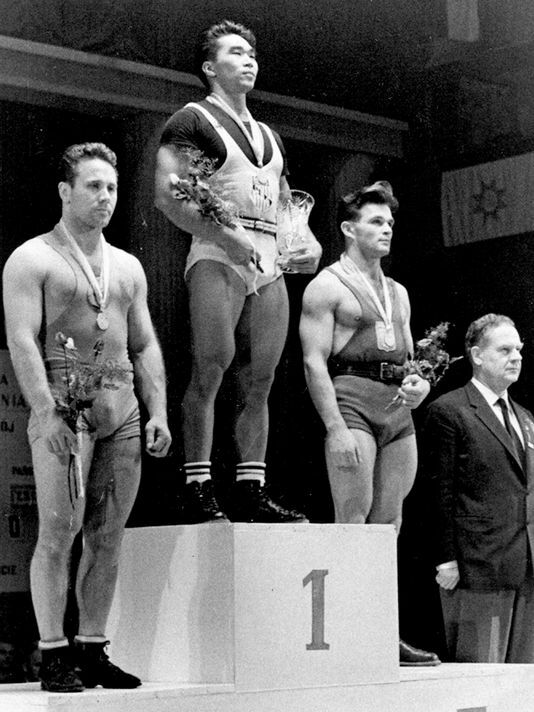 He also won the World Weightlifting Championships six consecutive times from 1953 to 1959, finishing his career in 1964 with 26 world records and 7 Olympic records. If that weren’t enough, as a bodybuilder, he also won Mr. World in 1954, then Mr. Universe in 1955, ’57 and ’61. And during that competition in 1961, he inspired a 13-year-old Arnold Schwarzenegger, watching in the crowd, to go home and hit the weights. And yet, somehow, Kono’s achievements have been relegated to obscure trivia today, when he should have been the stuff of national folklore. His absence in American history is something that Ryan Yamamoto, an Emmy-award winning news anchor in Seattle, hopes to correct with his 30-minute documentary, “Arnold Knows Me: The Tommy Kono Story,” set to premiere on July 26 in Kono’s hometown Sacramento. The Post Game‘s Cole Jacobson has a detailed write-up on the documentary, and an interview with Yamamoto, who himself had never heard of Kono until meeting him by chance. The documentary’s title refers to a story about how Kono would playfully reply to anyone asking if he knew Arnold Schwarzenegger. If you feel so inclined, the project has a GoFundMe page where you can contribute to help cover the costs of the documentary’s production. In 2004, the York Daily Record‘s Jim Seip wrote on Kono’s time in Tule Lake and later during his training days in York, PA. His poetic insights on Kono’s hardest times are very much worth the read. Kono once said he would never return to York after his first visit there. It was unsettling the way people stared at him outside of the gym. But inside, he was respected as a lifter. “They only saw him as an American,” writes Seip. Kono would return for years to train with the York Barbell Club, the country’s best weightlifting program. Only the devout weightlifting historians will remember Kono now, but he is there, waiting to be rediscovered for the rest of us. He is, “painted in the center of the ‘Muscletown USA’ mural in York.” He is one of the first faces you see when you enter the USA Weightlifting Hall of Fame in Emigsville. “Muscletown, USA” mural in York, PA. Photo from York Daily Record. Everything about Tommy Kono is legendary, he was, “an asthmatic 14-year-old when a neighbor first gave him a dumbbell,” at Tule Lake. He was self-taught, he never had a coach. Kono overcame a childhood spent in a Japanese internment camp to go on and accomplish feats worthy of an American icon. He just never became that American icon. Tommy Kono is not a household name, and he may never be, but we as a nation should know him better. We should not have let him pass as merely a footnote. With his documentary, Yamamoto hopes that maybe this time Kono’s story will stick. Cover photo from New York Times.